Action Adventure Phoenix Fishing Charters Father & Son team. Largest boat 39' Tiara, In Our 30th year of business. Your charter will be a fun filled adventure. Phoenix Fishing Charters provides quality Salmon fishing with breakthrough and innovative fishing methods on a new 39 foot Tiara sedan bridge. The cabin is heated or air-conditioned as needed. The Phoenix has the best catch rates for the Port of Sheboygan Wisconsin in 2018. Home of the best Salmon action on the Lake. If you're serious about a charter. We're serious about fishing! We offer exceptional Value. On a Phoenix Charter, you are going to have fun and enjoy your trip. Customer satisfaction a must. Skilled or unskilled welcome. Friendly, Courteous, Professional, I guarantee the best equipment that you will find on any charter boat that you have ever fished on the Great Lakes, all furnished for you. Enclosed clean, private, large head. No Sheboygan charter boat will fish harder for you than the Phoenix and her crew. This is your charter and we work for you. Captain Steven-John has been fishing the port of Sheboygan since 1978. The vessel Phoenix has been upgraded to a new Tiara 3600, 39 feet in length, and a 14 foot beam. Tiara makes the best yachts in the industry. We will perform above the rest in the industry. Our new, extra large vessel will be ready to depart, after you have had a safety information talk. It is all shaping up to be a great fishing season. The cabin is heated and air-conditioned. 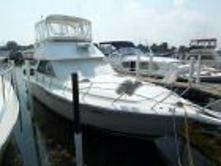 The Phoenix is Sheboygan largest, full time, and most reliable Wisconsin Salmon fishing charter boat. Anglers can relax with a Sheboygan Wisconsin fishing charter. So if you are looking for Lake Michigan fishing charter, where people are out to have fun and catch a mess of fish. Than your search is over. What separates the Phoenix from the rest of the industry? "You, and your safety is the most important thing on our boat. We recognize and value your trust and friendship. Customer service on our Wisconsin charter boat is like a grand opening every day. Fishing Lake Michigan is your solution. The Phoenix will catch the most fish per trip, and is not limited to working one area, such as the harbor. The Phoenix has over 16,000 lures and 36 rods on board, and we know how and where to put them. 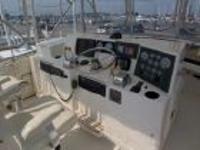 The Captain and first mate is a father and son team, committed to supplying the best service possible. The Vessel Phoenix is DNR and U.S.C.G. licensed, and carries the Coast Guard approval sticker on the Port Side of our vessel. Charter fishing Lake Michigan, Port of Sheboygan is known for quantity, and size of fish. 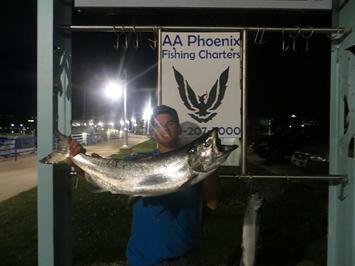 Phoenix Charters is your solution to a fantastic Lake Michigan fishing trip. Take command of your opportunity to experience Lake Michigan charter fishing at its finest. This is your solution to selecting a fun filled, safe adventure. Remember the weekend of June 1st and 2cd is Wisconsin Free Fishing Weekend, This means that no fishing Licenses are required. STOP Find out how we can help you! 920-207-7000 For quickest reply, or information, call us today.